"The Magic Power of the Ninja Is About to Reveal Itself..."
American Ninja V tells the story of a great warrior's grandnephew who goes by the name of Hiro. Hiro is said to be the last of a dying breed of ninja. He is being sent to Joe Kastle, the American Ninja, in order to gain experience pertaining to the martial arts, specifically ninja training. Trouble ensues when a group of renegade martial artists arrive on the scene to cause utter chaos and havoc and kidnap a young lady very dear to Kastle. A tale of heroic action ensues as Kastle and his new apprentice venture into dangerous territory in order to rescue the woman. 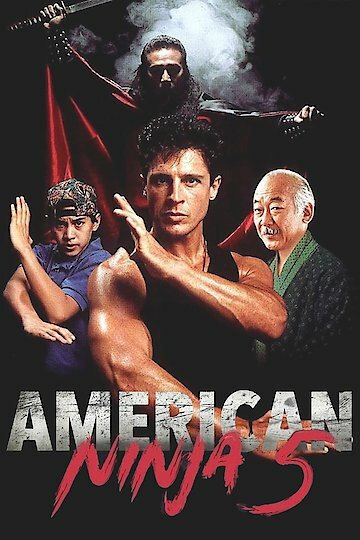 American Ninja V is currently available to watch and stream, buy on demand at Amazon, iTunes online.